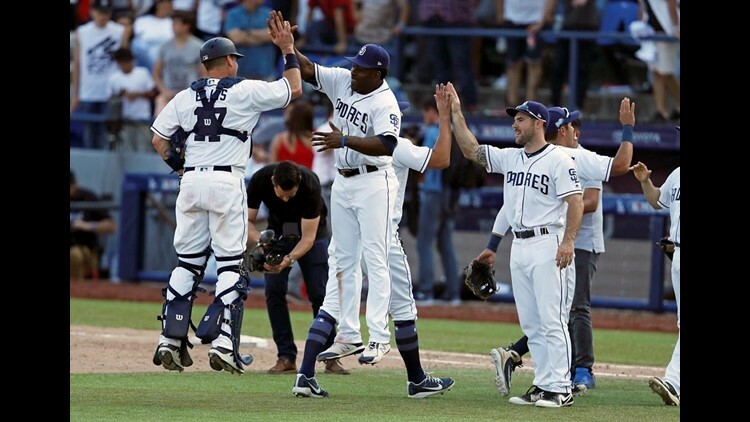 MONTERREY, Mexico (AP) — Eric Hosmer hit a go-ahead, two-run homer for the second straight day, rookie Eric Lauer got his first major league win and the San Diego Padres beat the Los Angeles Dodgers 3-0 Sunday to take two of three in Major League Baseball's first regular-season series in Mexico since 1999. Matt Kemp had two hits and is 11 for 22 with three homers and nine RBIs against the Padres this season. Padres rookie Christian Villanueva, hoping to become the first Mexican to hit a major league home run in his country, was 0 for 12 with a walk in the series. San Diego manager Andy Green said Villanueva was trying to do too much to please the crowd. Dodgers: RF Yasiel Puig (ankle) will start a rehabilitation assignment with Class A Rancho Cucamonga on Monday or Tuesday and will be ready to return to the Dodgers on Wednesday, according to Los Angeles manager, Dave Roberts. ... 2B Logan Forsythe (shoulder) is expected to begin his rehabilitation with Triple-A Oklahoma City. Dodgers: LHP Rich Hill (1-1, 6.00), who has not pitched since April 14 because of inflammation of the middle finger in his pitching hand, is expected to be activated from the DL to start Tuesday's homestand opener against Arizona. Padres: RHP Tyson Ross (2-2, 3.28) starts Monday's series opener at home against Washington.